It seems as though [Nathan] has taken some serious inspiration from the Warthog. The iconic armored buggy from Halo video games has a turret mounted to the roof. Although [Nathan]’s buggy only shoots paintballs from its turret. Mounting paintball markers (guns) to various objects such as vehicles, robots, or other machines isn’t quite as straightforward as it seems. Vibrations from anything can transfer through a clamping system and cause paintballs to break. This, of course, inhibits the functionality of the marker and is a messy cleanup to boot. Then there has to be a way to fire the paintballs, which is usually handled by soldering to the electrical connections in the marker. And the entire rig has to stand up to the normal jostling and sudden turns from the buggy. [Nathan] has solved these problems first by creating a custom fast-change mount that allows any malfunctioning markers to be changed rapidly. The electronic firing mechanism is handled by an ATtiny microcontroller and there is a custom electrical connection that is automatically made when the marker is bolted to the mount. The new system allows markers to be changed in about 30 seconds, much better than any other system. Maybe in the future [Nathan] can upgrade the buggy’s turret to accommodate a paintball minigun. 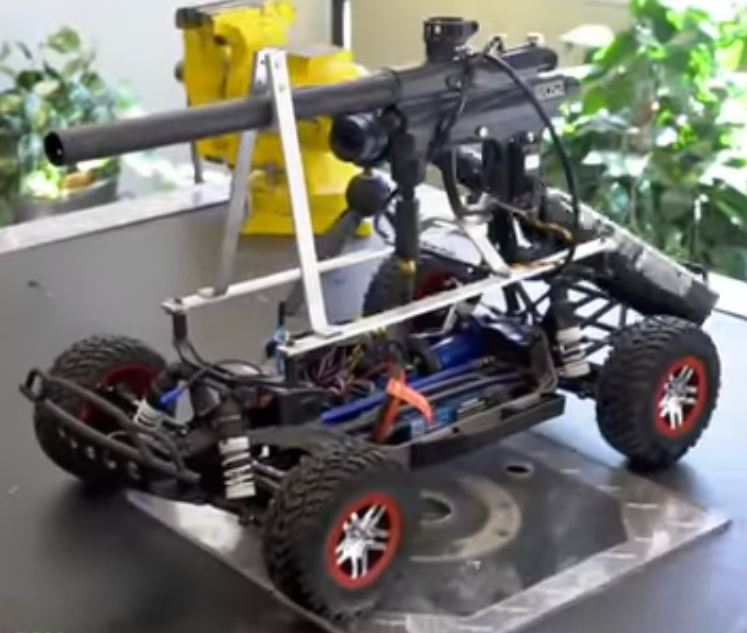 We’ve seen quite a few automated paintball marker systems over the years. Generally it’s the same story – a motion detection system used to target and fire upon the opposing team, prowlers, spouses, etc. [Waterloo Labs] decided to take a slightly different approach, and create a system that intentionally misses its target. Paintball Picasso uses a pair of Tippmann A-5 paintball markers to draw an outline around the person in its sights. This is a rather safe project for [Waterloo Labs], considering their previous adventures in car surfing. The Paintball Picasso system uses a webcam to capture an image of a willing test subject. Picasso then processes the image. The human outline is plotted on a 50×50 grid of paintball pixels. Then the real fun begins. Paintball Picasso uses a National Instruments myRIO to command two paintball markers to simultaneously fire. The markers are fitted with high torque R/C style servos for pan and tilt. At 10 rounds per second the markers quickly draw the human outline. The test subject walks away slightly splattered, but otherwise unscathed. With a matrix of 2500 points, [Waterloo Labs] has enough resolution to draw some basic logos. We liked the mounting system [Waterloo Labs] created for the markers. Using a mix of 3D printed parts, Lego Tetrix, 80/20 aluminum extrusion, and ball bearings, they fashioned a mount that moved smoothly enough for R/C servos to actuate, yet was strong enough to withstand the kick of firing. We’d love to see the servos swapped for stepper motors and belt drives. While open loop, stepper motors would afford more accuracy and a longer life than PWM driven R/C servos. [Spider! ]’s contribution to the pantheon of paintball markers is the SMAC: a unique revision to one of Airgun Design’s ever-popular Automags. We needed our tipster, [Russell] to provide some context on the Automag’s evolution, because the brand has served as a popular hacking platform for nearly 20 years. The most frequent is a “Pneumag” modification, which converts the original, fully-mechanical trigger pull into a version where the trigger actuates a pneumatic cylinder to fire the gun. According to [Russell], the Pneumag’s trigger must completely release between each shot to properly recharge the firing chamber. Without a full release, the gun can load extra balls into the barrel and lead to gloppy consequences. Electronic controls solve this problem, but [Spider!] favored an analog solution that captured a “less is more” mentality over a pre-fab microcontroller board. He built the circuit around a 556 timer used as a delayed re-trigger, but with a few modifications. Swing by [Spider! ]’s forum post for additional details, a cluster of pictures and a bill of materials. Microcontroller alternatives? We’ve got you covered. [Jared] has updated his paintball gun turret page with more detailed assembly videos. You can read more about the project in our original post. [Jared Bouck] has been sending in his projects for a couple years now. We’ve enjoyed his heavy-duty DDR pads, LCD backlight repair, and ion cooling projects. His latest, an RC paintball gun turret, is our favorite though. He actually rates this as one of the easier projects he’s published; it just took a while to assemble. Several design decisions were made to keep the project simple. Two 32 Degrees Icon-E paintball guns were used. The guns already have electric solenoids for firing, so a special trigger mechanism didn’t have to be fashioned. Q-loaders were used to prevent any ball feed problems. The motors, driver boards, and RC components are all borrowed from combat robots for reliability. He’s hoping to produce a small number of kits based on this design. Related: We’ve got quite a few sentry gun projects in the archive.